Van Jones spoke to a nearly full house last night at UCSD’s Price Center. The crowd was diverse – old and young, multiracial, male and female, and most notably right and left. Inside the auditorium before the speech. Photo by Carl Manaster. Supporters – from the left – made up the bulk of the crowd, but probably five percent were from the other side, holding signs that accuse Jones of having an “evil” agenda, calling him a “radical communist”, and calling his green jobs “snake oil”. Jones’ talk was lively and entertaining; he controls the energy of the room like a cross between a standup comic and a preacher. Jones directed his lecture to students, talking about the legacy his generation is leaving them. He spoke of three problems his generation is leaving them: that they must figure out the next economy, that the cheap energy bubble is at an end, and that, between economic pressure and racial and cultural diversity, people are either going to turn to each other, or they will turn on each other. He spoke of three fallacies that have led to the current system: that it was okay to send all our jobs overseas, that it was okay to base an economy on credit, and that it was okay (and possible) to exploit resources without end. We need, he said, to return to thrift, to conservation; we need to become more efficient; we need to restore the planet. He told the students, “you ain’t gonna have a job” – you will have to create your own. He said that if this generation solves his three problems – figuring out the next economy, dealing with the end of cheap energy, and getting people to turn to each other instead of turning on one another – if this generation solves these problems in America, we will be an example for a rainbow planet. Toward the end of the lecture, he got personal – explained his roots, coming from a father who grew up in abject poverty and made his way through the military, into the police, and later becoming principal of a tough school. How he got to Yale law school and noticed how debauched it was. Noticed the outrageous injustice of cops driving past Yale students smoking joints to arrest kids in the projects – just three blocks away – for doing the same thing. 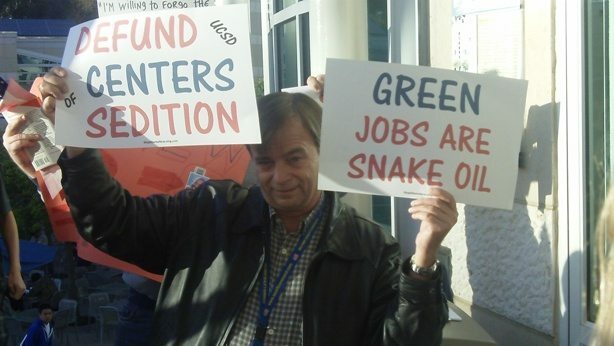 “I’m not asking for more welfare – I’m calling for more work!” He called the rules of our energy sector “wacky”. Eventually the moderator suggested the kids with signs get up in front, so their signs could be seen and everyone could still see the stage. That seemed to be an acceptable compromise. Finally, he called for both sides to come together to solve these very big problems. He feels that the issues we face are too big, too serious, for partisanship. There were questions and minor protests – which gave him a chance to demonstrate just how peaceful and agreeable he can be, to very disagreeable people – and book signing after the lecture. Carl Manaster is a local political activist who has been a delegate to the California Democratic Party and was a volunteer on the 2004 John Kerry campaign in Ohio. He has worked on issues including political accountability, gay rights, and single-payer health care; last year he was arrested sitting in at a health insurance company. Editor: We have also posted notes on the content of Jones’ talk – go here. 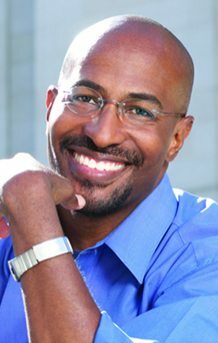 “Van Jones is quite simply one of the few Americans in recent years to have generated powerful new ideas that are creating more jobs,” says Benjamin Todd Jealous, president and CEO of the NAACP, which awarded Jones the National Association for the Advancement of Colored People 2010 President’s Award. Jones presents the greening of America as both a moral imperative and a nuts and bolts economics issue. An American environmental advocate, civil rights activist, and attorney, he formerly served as special advisor for green jobs for the White House Council on Environmental Quality, and is currently a senior fellow at the Center for American Progress and senior policy advisor at Green For All. Jones’ lecture comes at a time when proposed U.S. legislation on energy efficiency could create more than 500,000 jobs within two years, according to the American Council for an Energy-Efficient Economy. Demand is growing for employees who have skills in the clean technology arenas including energy efficiency, water efficiency, renewable energy and clean transportation. From hands-on jobs such as installing solar panels and maintaining electric vehicles to computer programming and researching fuel cell technologies, California’s job landscape is poised to grow a low-carbon, clean energy economy. Carl- thanks for this post. I wasn’t able to attend the event. Its a shame that he is no longer in the White House because of political pressure. He represents the future of political leadership: practical, progressive, and intelligent. I was there at the lecture and was sitting right next to the protesters with the signs. They were very respectful and I thought Van did a great job of handling the situation. He had them hold their signs high and read the signs aloud in detail. When he mentioned that the messages on the signs hurt his feelings, it was one of the girls holding the signs that said, “It hurt me when you called Republicans assholes” not an asshat from the back. And she didn’t yell it; she said it loud enough for Van to hear. Nevertheless, Van handled it like a pro and treated the protesters with the respect they deserved.